“Shall we dance again?” Linnetta asked, hoping to stop the conversation, but she regretted the words as soon as they were said. Just getting to her feet made her feel light-headed, and she clung to her partner as they made their way to the dance floor. Where was her father? Once she could have counted on thoughtful Ginevra to save her from such a predicament, or for Celestine to cause some sort of distraction. “It’s all right,” he said. “This will be the last dance before the announcement of the queen.” She could hardly pay attention to the dance or the music; she had to fight back the feeling of being overwhelmed. It didn’t help that her partner was still talking about her family. “Of course. You wouldn’t have needed to know things like that,” her dancing partner replied. Love love love this dress. Such pretty shades of red. I wish I had your talent. As far as literary characters, I think it would be cool to have like Jo from Little Women, Dorothy from the Wizard of Oz, Wendy from Peter Pan, Alice from Alice and Wonderland, and maybe some Harry Potter dress robes, or a dress from the Crucible or the Scarlet Letter. maybe a dress for Scarlett O’Hara, Anna Karenina, or main character in Memoirs of a Geisha. Or maybe an outfit for the girl that Pip loves in Great Expectations. Or maybe an outfit for the elf queen/princess, i forget her title (tieing in fairies kind of) from eragon/eldest. oh and by the way this is definitely my favorite gown so far. Oh, forget what I said earlier about my favorite dress. This one is stunning. I’ve always loved wraparound styles and the bell sleeves, and gradients, and this is AMAZING! Well if you want literary how about Lady Murasaki? Or since you didn’t do witches how about Glinda from the Wizard of Oz? not the film version but the Sorceress of the South in scarlet as in the book. The dresses and story are lovely by the way, may I list my deductions so far or would you rather we wait for the finale? Actually Murasaki isn’t very Halloweeny, but she did have a character who slipped out ofher body as she slept to murder her rival. That is GORGEOUS!! I love the red layering. Pride and Prejudice and Zombies is a brilliant idea! The story is starting to get interesting… is he going to kill her??? 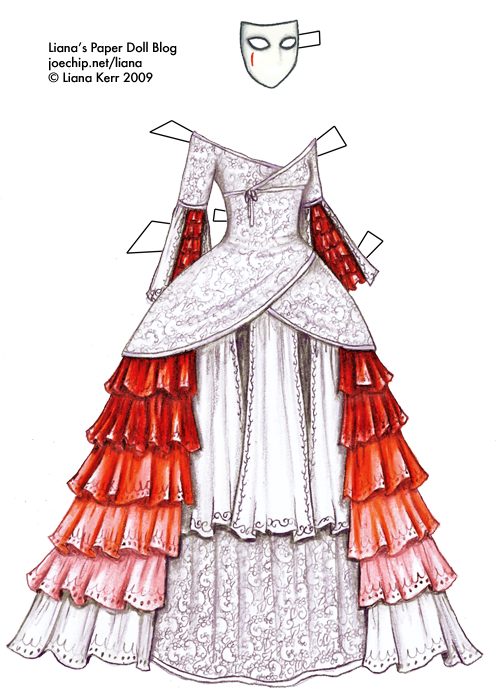 Oooh, I love all these masquerade gowns…and the story is getting intense!!! I like Alice in Wonderland for literary characters. Maybe Scarlett O’Hara as well, though she’s not Halloween-ish. Have you ever read the book Coraline? You could make an outfit for her, that book is rather Halloweeny. This dress is so beautiful, all of them are. I loved the story too. How about a feminine version of the Phantom of the Opera’s ‘Red Death’ costume? Or something Catherine from ‘Wuthering Heights’ might wear. I think you are amazing at this. I love ALL your dresses & other costumes. Great story too. I’ve been to other paperdoll sites but NO OTHER SITES are as good as this one. Trust me on this. Keep updating! I especially love those ruffled layered gradually becoming paler. Such a fantastic idea! i agree with colleen! but i also think you should do tinker bell tooo! oooo! the choices! lub evry dress! e’specialy the maskquerade 1z!!! !